The programming rationale for this disc is excellent. 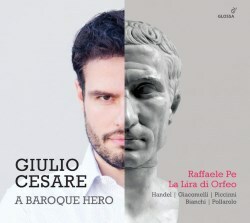 The focus is on Julius Caesar in Baroque opera, not least via the influential libretto written by Giacomo Francesco Bussani in the second half of the seventeenth century. This was the basis for the subsequent opera by the significant Venetian composer Antonio Sartorio. Bussani’s libretto was most famously adapted by Nicola Francesco Haym for Handel’s Giulio Cesare in Egitto. Subsequent revivals of that first canonic libretto saw operas by such as Niccolo Piccinni in 1770. In a performer’s note the countertenor Raffaele Pe outlines, as is his prerogative, that he wishes to ‘dissociate’ himself from what he terms forms of singing that have been ‘definitively perfected by certain pioneer performers from the preceding generation’ and wishes instead to generate a new aesthetic for the countertenor’s vocal register that embraces soprano and contralto registers. I don’t quite know who these ‘pioneers’ are – surely not as far back as Deller or Oberlin, from the description of ‘preceding generation’, but maybe singers such as Esswood, Bowman, Ragin, Jacobs, Chance, and Kowalski? As for vocal registers, haven’t some of today’s leading countertenors been doing precisely for some time what Pe suggests they have not? Given these rather didactic, even judgmental thoughts I was warmed up and ready for action. I expected something of a new approach, and levels of vocal sophistication and a powerful sense of characterisation. I’ve certainly enjoyed Pe’s singing in the past but here, I’m afraid, generally less so. We are used to performances of Handel’s Va tacito e nascosto where the horn is an equal obbligato partner in the acoustic balance. Here it’s submerged in the orchestra, in an acoustic that is throughout the recital unhelpfully flat and one-dimensional. Pe sings attractively but his embellishments in the da capo are too florid and play around with the key too willfully. In Son nata a lagrimar he is joined on the only such occasion by mezzo Raffaella Lupinacci with whose voice Pe conjoins well. I wish I could like the performance but it’s lumpy rhythmically, neither flowing nor moving, and smoothed out. The third Handelian aria is Al lampo dell’armi which shows up another disappointing feature. There is no conductor to inject electricity into these performances and the playing of La Lira di Orfeo, concertmaster Luca Giardini, does not sound inspired to overmuch vivacity. In fact, here it sounds dangerously by rote and dutiful, and neutered by the recording. There is little sense of interplay between singer and band. Yet a number of things are excellent. Giacomelli’s Il cor che sdegnato features splendidly assured virtuoso singing, poised and clear. Piccinni’s Spargi omai is refined and Pe finds sufficient elasticity in the B section – in general he’s scrupulous not to toy or elongate the B sections – in the same composer’s Tergi le belle lagrime. There is apparently a first ever recording of Pollarolo’s Sdegnoso turbine and of Non temer! which adds to the store of Caesarean opera on disc. Eleven minutes of the recital is given over to a so-called Bonus Track, Handel’s Scherza infida from Ariodante. This is an envoi obviously unrelated to the Caesar principle that has motored the disc, and whilst it is in many ways beautifully sung all those colours that Pe writes about sound all too strenuous and the result is lacking in expressive feeling; too many embellishments in the da capo, too, once again. I am sorry not to be more appreciative of the work that has obviously gone into producing this disc. I wish the recording quality had been better, that a conductor had been engaged, and that there had not been so many mid-tempo lyrical arias. There’s a lack of variety. I also think in future it might be in Pe’s best interests to avoid implicitly criticising singers of the recent past – Bowman, for example, was technically vulnerable and frequently hooty but he could be very moving – and just concentrate on the singing.